Sybella, handmaiden of Death, is in a very dark place. Her father is pressuring the young Duchess of Brittany to marry him, killing anyone standing in his way. The Lady is only awaiting a sign from Him to put an end to this bloodbath, because surely, He will mark this scum of a father to die. Or won’t he? Dark Triumph is another amazing story brought to us by Robin LaFevers! This instalment starts right before the final ambush of Grave Mercy, this time from Sybella’s point-of-view, who tries frantically to warn the young Duchess of the treason, risking her own life in the process. Sybella was sent back to her family, the d’Albrets, one she fled years ago. This decision by the convent made her sick to the stomach, but she was promised she could kill her father. He is not marqueed though, and she must wait for Mortain to mark him for death before she can end him, all the while spying on him and trying to survive the depravation she is forced to endure. 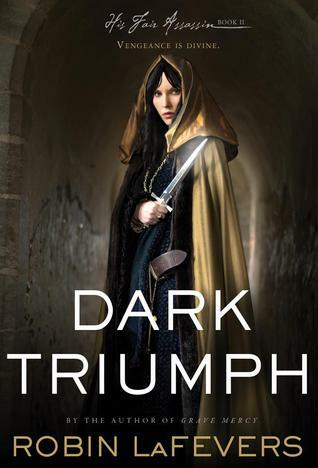 Dark Triumph is another book that didn’t grab me from the start. Robin has no choice but to set the mood of this novel, and reintroduce Sybella under a new light and it took about 50 pages before I really got into the story. The convent sent news that she must free a prisoner from her father’s holdings and that’s when my interest was picked. Dark Triumph is very different from Grave Mercy mostly because the focus shifted. Where Grave Mercy was really revolving around political issues, Dark Triumph is propelled by Sybella’s past and insecurities, her quest to find absolution and her growing relationship with Beast. Battles are still fought, and Brittany is still very much in danger, but this aspect becomes a support element instead of a driving force. The psychological element kept me glue to the page until late at night and I really couldn’t bring myself to let go. Sybella was highly traumatised and I really couldn’t grasp how deeply she was wounded until she opened up to Beast. Their relationship was truly magical and this soft brute is simply amazing. Every woman deserves a caring and forgiving man such as he. An aspect that really stood out is that the hero is ugly. So ugly that Sybella can’t help reminding him every now and then. In pretty much every romance, the hero is tall, strong, and handsome and I found quite refreshing to witness a woman fall in love not because of the guy’s looks, but because of his true nature. This historical fantasy was a rollercoaster of emotion and I have to command Robin LaFevers for it. Not only that, but she really committed to stay as close to historical facts as possible and this is probably the biggest compliment I can give her, she made me want to read more about this period. I, who’ve always hated history. The heart-pounding way Dark Triumph ended was cruel because we don’t really know what happens to each character. Hopefully the third book, Mortal Heart, which will feature Annith, will answer to my remaining questions. His Fair Assassin is an amazing historical fantasy story. Its extremely original lore and its captivating characters are not to miss and I strongly suggest you get your hands on those books, starting with Grave Mercy is you haven’t read it yet!